This one is for the newbies to Pinterest. You've probably heard about Pinterest's huge growth, and the large amount of traffic being driven to brands around the world. But it's another social media platform to wrap your head around; enough to give you a headache. If you have a product or service that appeals to women, especially in a creative field (wedding planning, florist, graphic designer, kidswear designer, fashion, cooking, food, packaging, art, craft, landscape design, architecture, party styling, events, and many other small businesses), and you want to get a head-start on this Pinterest thing, I've written an easy-to-read article just for you. 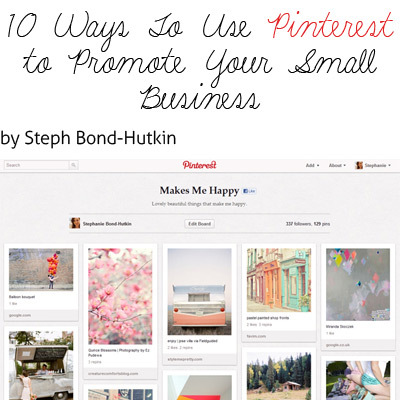 Head over to the Bondville Media store to download 10 Ways to use Pinterest to Promote Your Small Business. I run through the basics of how Pinterest works, how to use it for your brand, and 10 steps to take to drive traffic to your product/service/blog/personal website. I also encourage you to use Pinterest to deepen your connections with current and potential customers, and for relationships within your industry. And have fun too! (it's soooo addictive). (and please pass on to your buddies who may haven't dipped their feet in yet).